This was the start to the 618 step climb to the top of Skellig Michael, an island outside the coast of southwestern Ireland, where an ancient monastery sits. The monastery was used as a film location for Star Wars Episode VII: The Force Awakens. I got unexpectedly weepy today. It was brief, but poignant. Obi Wan Kenobi had just placed infant Luke Skywalker in the arms of Beru Lars. Aunt Beru, who we later learn this strong woman would be called, smiles, turns and runs to her husband Owen with baby Luke in her arms. That’s when it hits me. Uncle Owen is surveying the sunset blazing over his moisture farm – and not one, but two glowing star spheres are descending over the horizon. In order to gear up for the premiere of Rogue One, the first Star Wars saga spin-off movie to come out since the Star Wars holiday special and the Ewoks movies, I watched Star Wars Episode III: Revenge of the Sith. Kind of setting the mood sans candles and a nice dinner. If you know me, you probably already know I’m a Star Wars fangirl. I don’t even know how it really happened. I certainly didn’t intend to become a Star Wars geek. But it happened. And with great gusto lately. I’m a Jedi, like my father before me….er…wait. Start over. I’m a fan, like my mother before me. The Force (the supernatural power that holds the universe together) is strong in my family. My brother has it. I have it. But not everyone gets it. I had my friend Amanda come over to spend the night when I was in later elementary school or junior high. My first sleepover, I could think of no other better movie to show while sleeping on the pull-out couch in the living room than Star Wars: A New Hope. Amanda fell asleep. I was, like usual, enraptured. It’s OK, Amanda. I still love you. I’ve now been to two film locations. I vacationed in Crescent City, Calif., a few years ago, just a few miles from the redwood forest where scenes for the forest moon of Endor were shot (think the Ewok habitat) from Return of the Jedi. This spring, I extended my study abroad trip to Ireland by a few days to visit the remote Skellig Islands off the mainland’s southwestern coast. 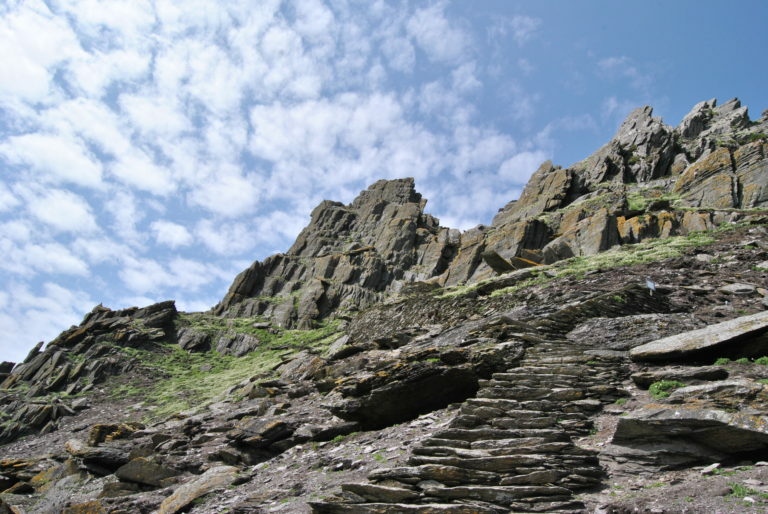 Skellig Michael and its ancient monastery is where the Jedi temple featured in Star Wars Episode VII: The Force Awakens was filmed. It has been confirmed that the site will be used heavily in Episode VIII. 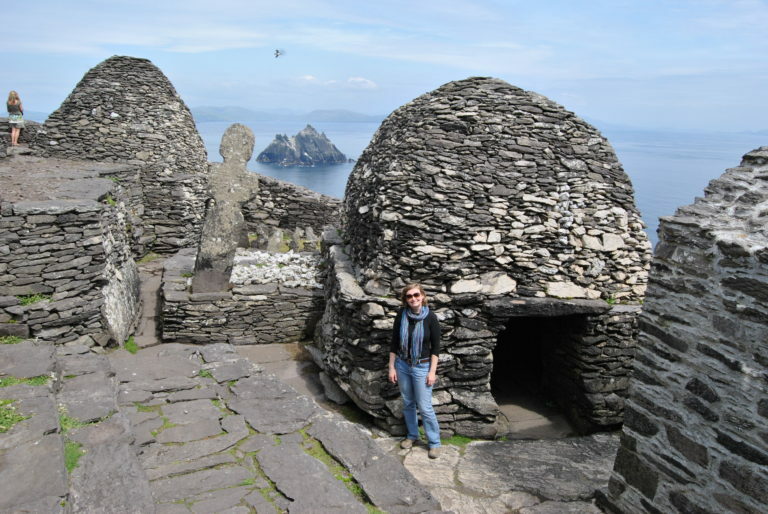 My goal was simple: to stand where Luke Skywalker stood. 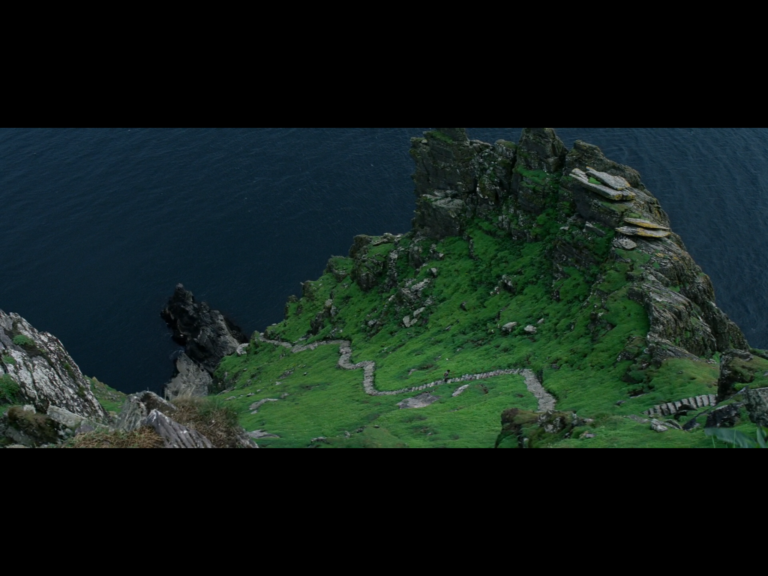 The trek to the Skelligs was arduous to say the least. Only 180 people a day are allowed on the island, a UNESCO World Heritage site. In order to reach the island, one has to book a trip on one of very few approved boat tours and take a 1.5 hour voyage. When calling about just a few weeks in advance, I somehow managed to luck out and schedule a prized spot, when other tours were full for several months out. The day of my venture, I packed to be gone all day. Instructions included being prepared for all weather elements, as Ireland anyway is cold and rainy enough; a trip on the sea could be dubious. Other instructions included being prepared for choppy seas (stocked up on Dramamine), packing a lunch and water to drink and comfortable, sturdy shoes. Also, there were no bathrooms on the island or the boat, so be prepared to hold it all day. 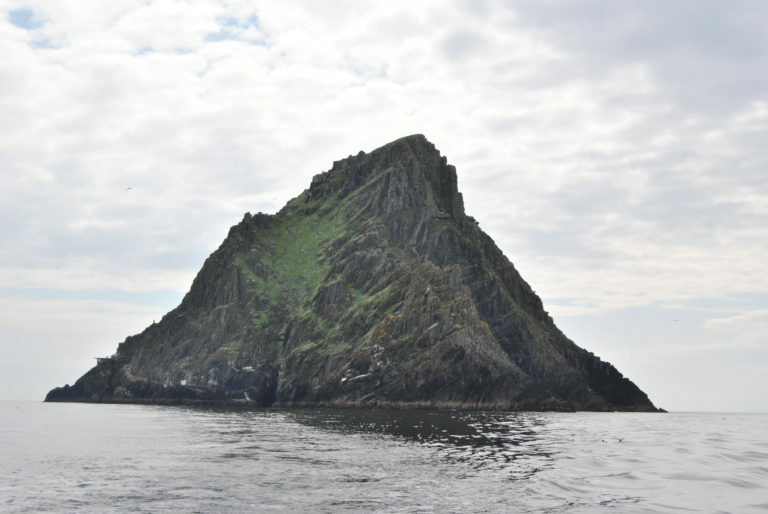 Skellig Michael – in all its glory. Our excursion that day was incredible. Ethereal. One day has provided me with stories for days. My Catholic bed and breakfast hosts on the mainland, once I told them of my ability to secure a pass to the island, the perfect weather, glass-like ocean conditions and other spectacular sights along the way, looked at me like I was the Virgin Mary herself. Many tourists, they said, come specifically to travel to the Skelligs, stay a week, and never make it to the island due to poor weather conditions. Once we landed on Skellig Michael, our group had about three hours to hike to the monastery at the top and traipse around. We were met and lectured by a trail guide at the bottom, who made sure to tell us that one wrong step amongst the 618 rough-hewn stone stairs would lead to certain death (as it had claimed a life or two in its history). 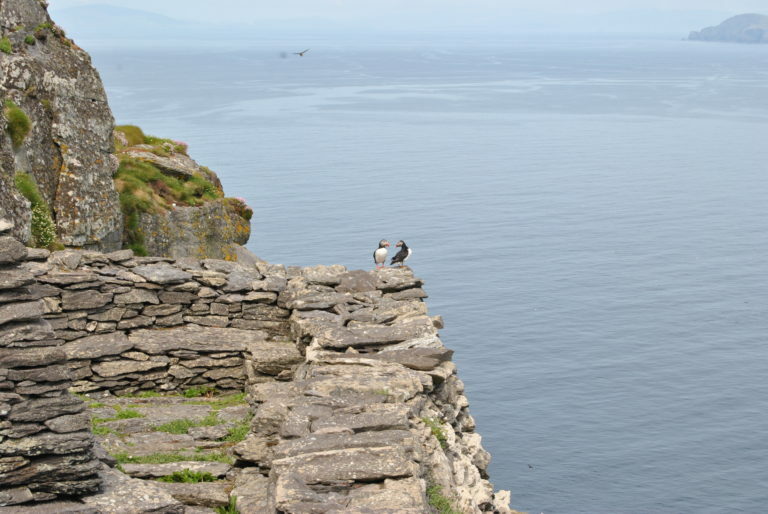 During mid-May, a large puffin population, along with other rare bird species, migrate to the Skelligs to mate and such. This little guy was just hanging out under a ledge on the way up the craggy island. My adventure mates (a pair of brothers from Chicago and a lovely Dublin-native named Sarah – all Millennials) and I cautiously trekked to the top. The way up took about 30 total minutes, but included several stops to take photos of the views, PUFFINS (who take refuge on the island to mate), and rest our searing muscles. We ate our lunches in a grassy valley near the top in order to keep the sacred monastery site holy (the guide’s surprising orders). When we reached the summit and the ancient monastery, we were blown away. The rock huts were still standing after centuries of battering from wind, storms, sun and rain. The asceticism was palpable. God was prayed to, believed in and worshipped here in this place by some of the world’s earliest and most fervent Christian followers. 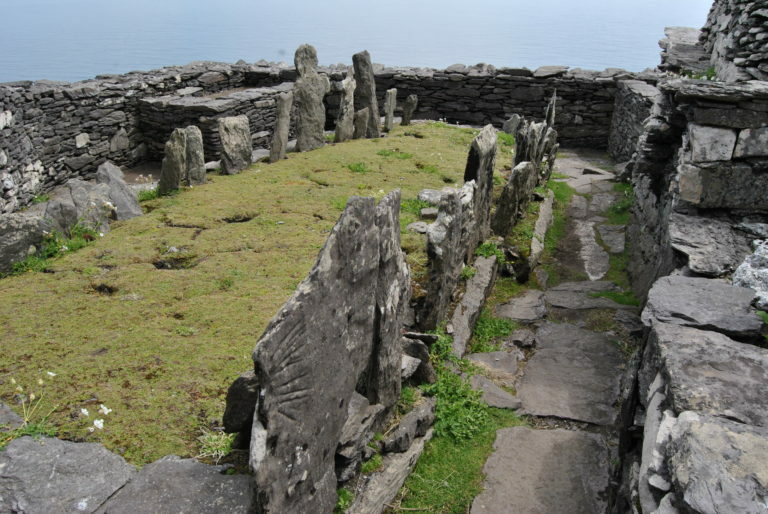 The earliest documents point to around 600 A.D. as the date for Christian monastic arrival to the Skellig Islands. Many monks lived and worked on the island growing food, raising small livestock and fulfilling their ultimate goal: worship of the Most High God. 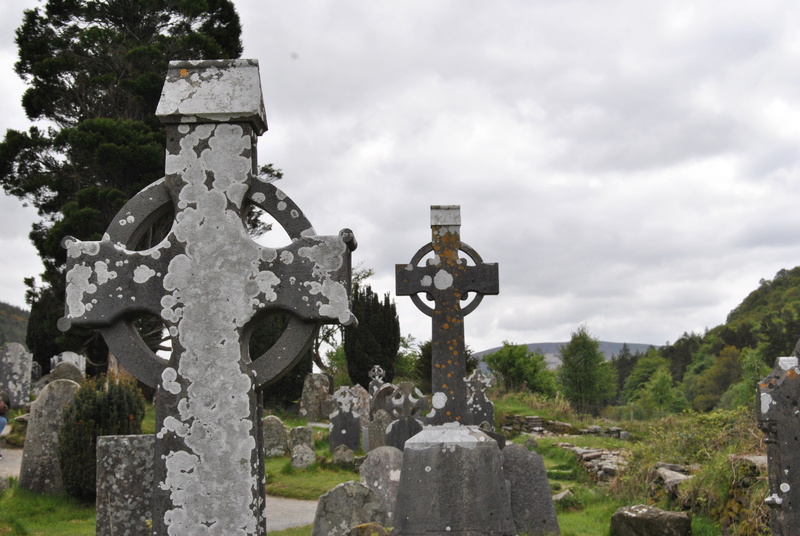 Atop the summit of Skellig Michael, the monks would bury their own within the monastery. The larger the marker, supposedly the more holy the monk. Later, a light house would be built on the other side of the summit. Yes lady, smelling of patchouli and sporting armpit hair, I know the Millennium Falcon is not ACTUALLY real, but throw me a bone. The Millennium Falcon may indeed have been photoshopped into the movie reel, but so many of the scenes with the island are real. This is one of three stairways leading to the summit. It is so steep that visitors aren’t allowed to use it. Of course, this is the path that Rey took. The top photo is my shot…the bottom is straight from the movie. You can see Rey climbing if you look closely. For me, Star Wars represents the ultimate battle of good versus evil. It’s the oldest story line in creation, even if you don’t believe in Capital ‘C’ Creation. Bad guy rises to power. Underdog good guy challenges him. Fights, pursuits, duels ensue. Pure goodness wins over absolute evil. I see Biblical truth in the movies, especially the original Episodes IV, V and VI. Luke Skywalker, searching for identity and finding it through the Force (Holy Spirit, HELLO?!). Darth Vader ditching the mask to reveal goodness and mercy. The fight to free all peoples of oppression. The sometimes overwhelming temptation to follow the Dark Side (blargh, Satan). Hope. Hope. Hope. I once wrote an essay for my high school novels class comparing and contrasting the themes of Good vs. Evil in Harry Potter, Lord of the Rings and ….Star Wars. I think I even dropped in a Jesus reference. I saw The Force Awakens five times in theaters. And zero regrets. 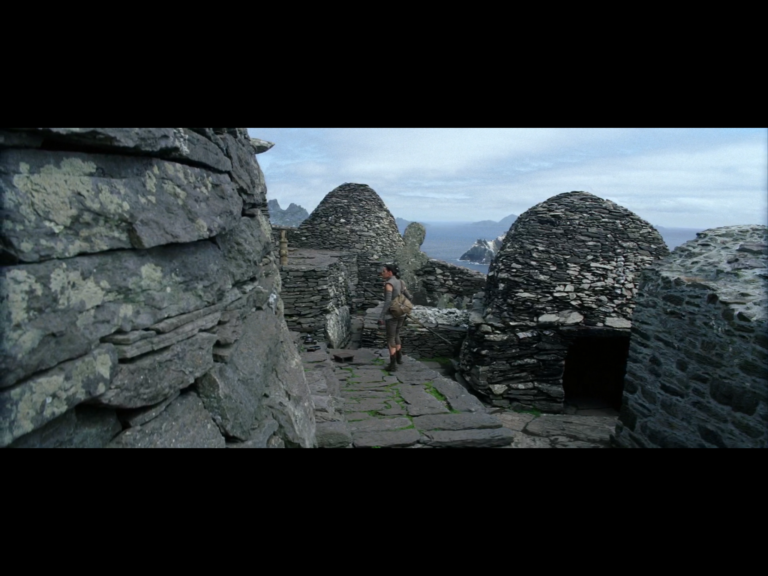 My trip to the Skelligs was lacking one small thing: I was unable to actually stand where Luke Skywalker stood in Episode VII. Why? 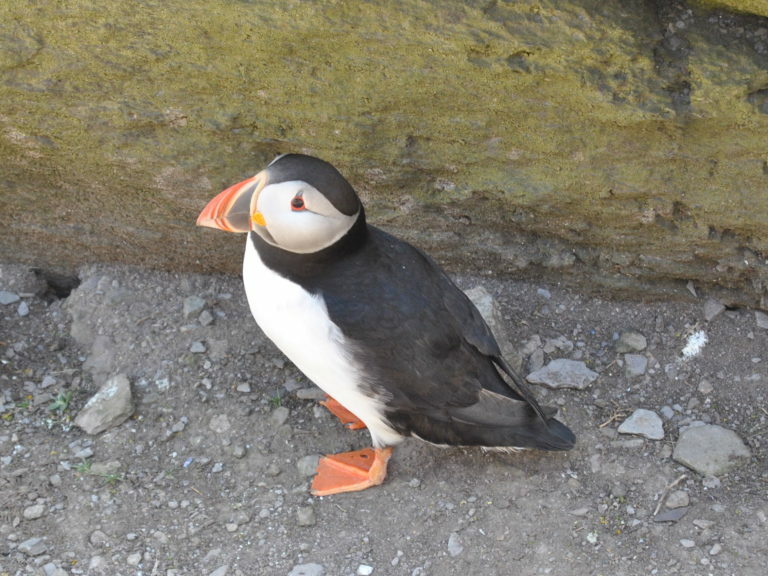 BECAUSE THE PUFFINS WERE BREEDING THERE AND WE CAN’T DISTURB THE PUFFINS. Another view from the monastery atop Skellig Michael. 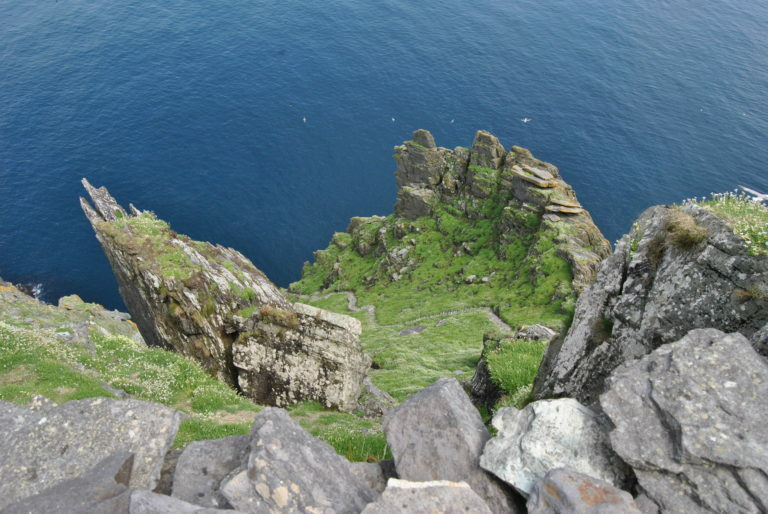 I truly hope the puffins at the edge are engaging in a courting dance as their rituals kept me from standing where Luke Skywalker stood – the very top of the island. Stupid, incredibly cute penguin-birds go ruining all the fun. But I did get to stand where Rey stood. STILL COOL. I, Dusty Luthy, climbed and stood where Rey, the newest Jedi of the saga, also climbed and stood. (Top photo mine, bottom is from The Force Awakens). Now I am typing to you, wearing Star Wars pajamas, the proud owner of 27 Star Wars-themed shirts and one Star Wars dress. I’ve cos-played as Han Solo (I didn’t even know the meaning of that phrase two years ago), and am planning on cos-playing again as another character Friday afternoon when I see the new movie. I feel like a kid on Christmas Eve. So why Star Wars? I don’t even know where to start, because I surely don’t know where to end. 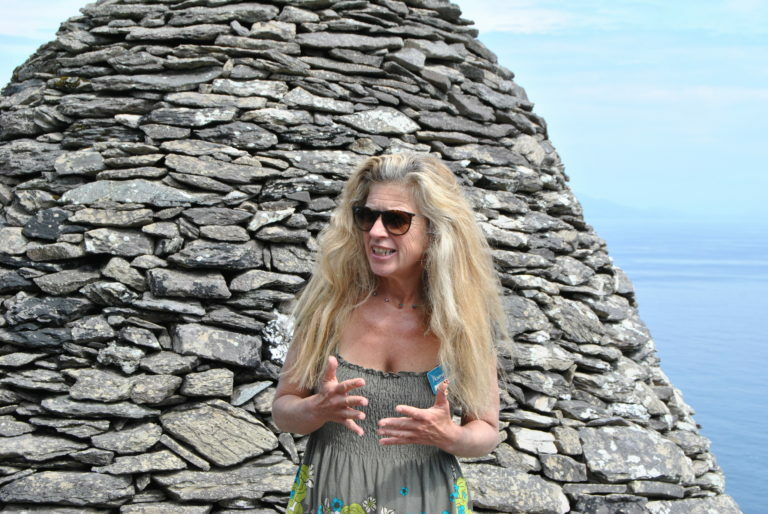 All joking aside, the guide who lived for a few weeks at a time atop Skellig Michael welcoming visitors from all over the world was very knowledgeable and kind to us.